A practical design with flourishes of elegance. 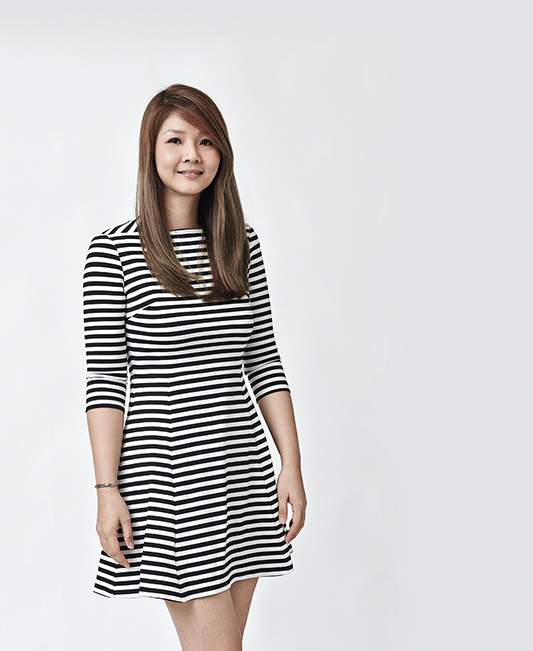 Designer Ashley Loh was tasked to come up with a distinctive design for this 4-room HDB flat. Drawing inspiration from the colonial English look, she created spaces that are remarkably stylish yet fully practical for the homeowner and his mother. Widening the entrance to the kitchen creates a more natural flow of light and space. A light-coloured neutral palette maintains the bright and open feel of this open concept kitchen. A beautiful combination of black quartz countertops and a mosaic tile backsplash adds to the sophisticated atmosphere. The designer also customised a built-in dining table using a cantilevered top that accentuates the open flow of space. 5-Room flat with dedicated spaces for work and play. 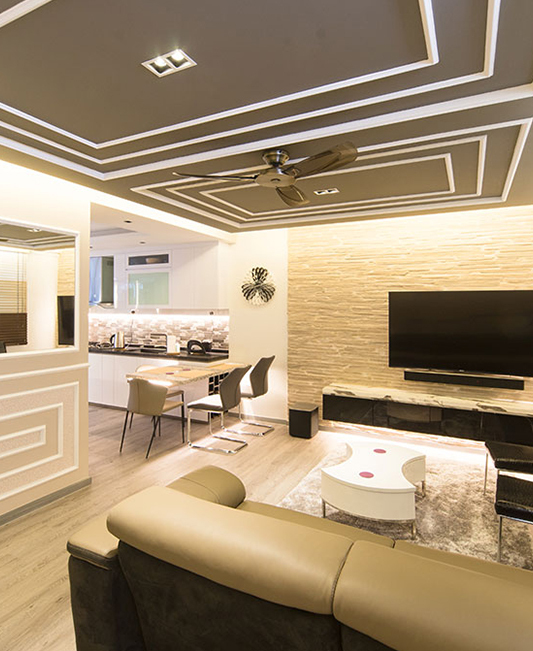 The young couple staying in this BTO flat knew that they wanted their home to be a place where they could rest, entertain and work. 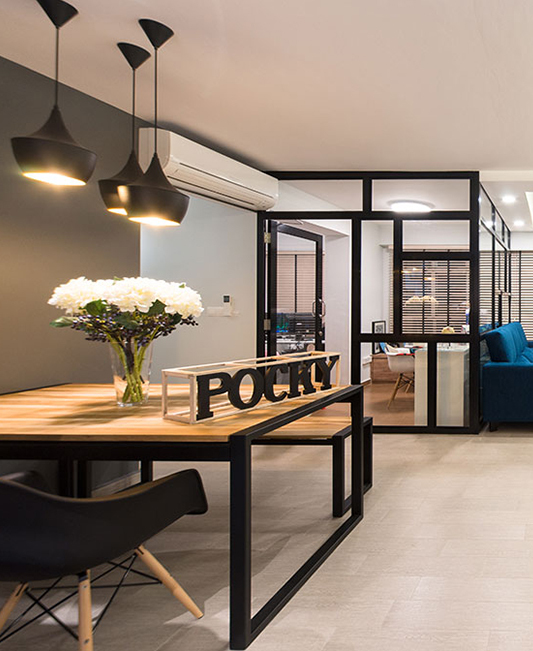 They engaged the design team from D’ Initial Concept to do up their new home and the result is a stylish abode designed with spaces that meet their various needs. 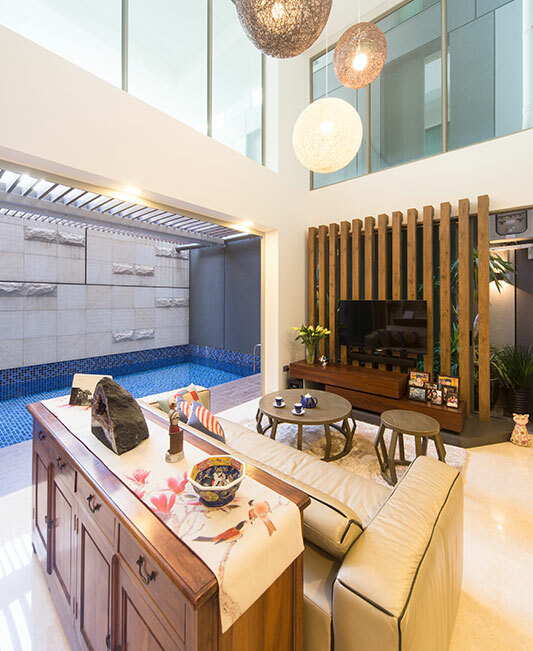 A customised bar counter shares the space in the dining area, providing the homeowners and their guests a cosy place to chill out after a meal. The wooden dining table and chairs complement the edgy feel of the dark-coloured background, while a trio of pendant lamps helps to anchor the dining space and completes the look. While proposing the style of this condominium unit, the designers from D’ Initial Concept had to work with the homeowners’ existing furniture. The married couple living here has also amassed a treasure trove of art pieces from their travels. To incorporate all these without cluttering the look, the designers deftly matched the elaborate details of the furnishings within a clean-cut modern landscape. East meets West in this carefully curated living area. 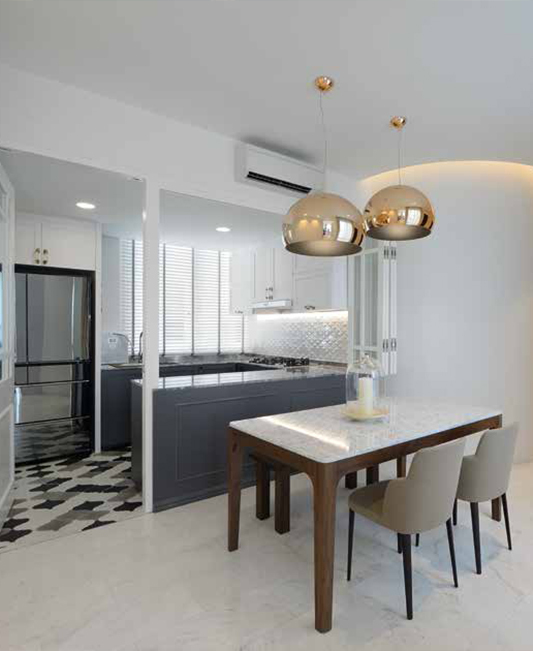 Not only did Manager Ashley Loh from D’ Initial Concept forge a balanced design scheme with the homeowners’ existing furnishings, she also ensured that nothing looks out of place here. It helps that the space has a double volume ceiling and a pristine white colour scheme was applied to serve as neutral ground. This allows the furniture to take prominence without overwhelming the final look. units for a bright and clean feel. Their designers from D’ Initial Concept used decorative doors and a mix of European-inspired finishings to achieve a design that fully meets their needs. A clean look was the priority for the homeowners of this resale apartment. With a preference for closed storage compartments over open shelves, they requested that most, if not all, built-in storage units to be closed up. Full-height closed cabinets were incorporated into the design but carefully balanced so that they do not overwhelm the space. Design has always been about creating versatile spaces that can be adjusted so anyone, even strangers, will feel comfortable. 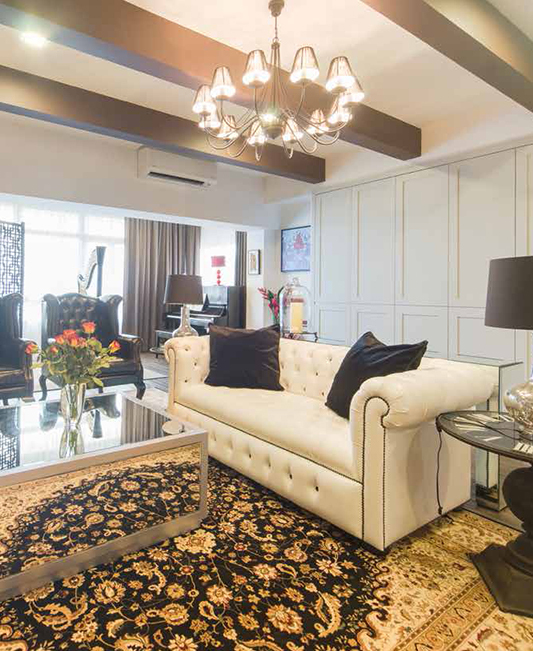 Modern and chic, this condominium unit is a sight to behold. The seamless composition of monochromatic colours add to the alluring charm of the home. Here, simple lines takes precedence, creating a relaxed and natural look. Mirrors create the illusion of a larger living space, and glass panels are installed for natural light to shine through. 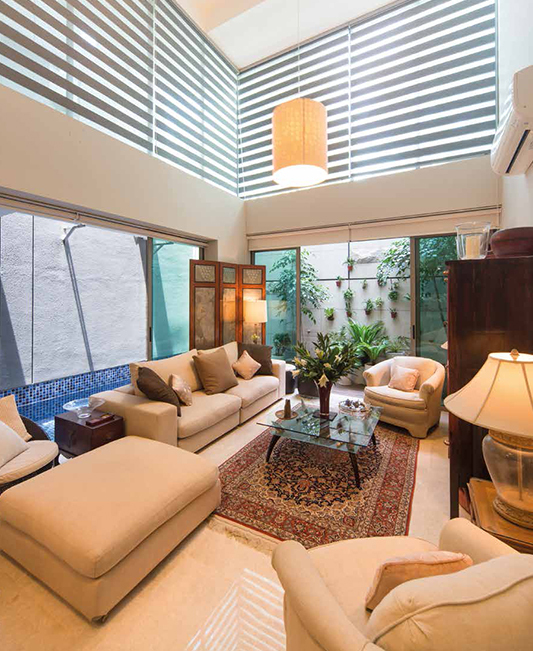 The living room is designed to be open and airy. Easy on the eyes, clean-cut and modern, the design takes luxurious living to a whole new level. Invigorate your senses with this clean and chic dining area. 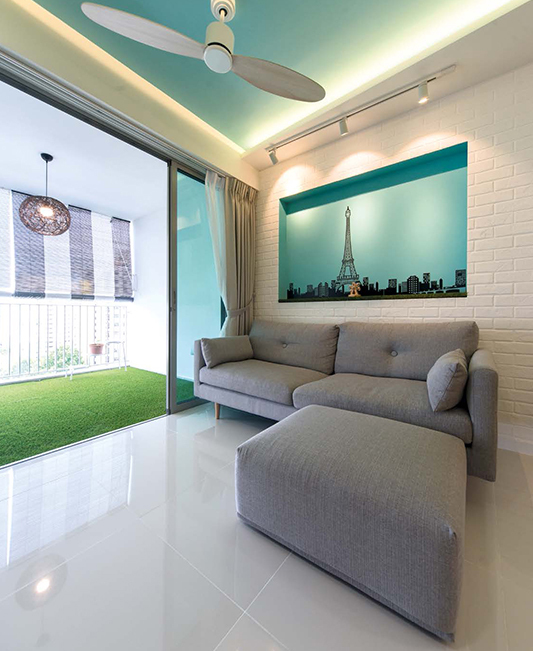 With light colours that are pleasing to the eyes, this home exudes cozy, soothing and inviting vibes. There’s no doubt that simple designs can work wonders. One will be captivated by the lovely earthy palette upon stepping into the bedroom. The perfect place to rest and unwind, indeed. The multi-person study corner is designed to be comfortably conducive, with lines that allow just the right amount of sunlight to flood the room.